IF YOU'RE INTERESTED IN THE SUSPENSE MEISTER THIS LOVINGLY ASSEMBLED SPOT SHOULD BE YOUR FIRST STOP ON THE WEB. In-depth information on all his feature films. 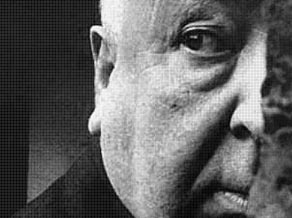 Some of Hitchcock's most famous sayings. From Ingrid Bergman to Bernard Herrmann. A series of articles from contributing writers. Monthly showings of Hitchcock's films and tv shows.